I let the live CD boot and run F15. 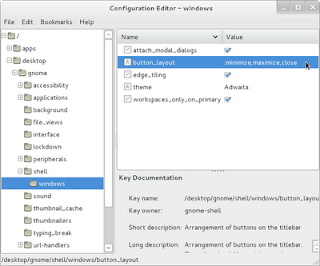 It comes with Gnome 3.0 and here is a link to Gnome 3.0 cheat sheet. I then chose to install it on disk using the link in "Activities" > "Applications". I chose to partition manually, allowed 500MB for /Boot and 30GB for / as I wanted to use the rest for Ubuntu. Installation was quick. Wizard is designed to warn on things like missing /swap partition, weak passwords etc. I also liked the fact that it was able to detect Time Zone correctly (in contrast to Macs usually defaulting to West Coast and requiring me to choose East Coast). Good job overall. "Transaction error could not add package update for fedora-release-rawhide-15-3(noarch)updates: fedora-release-rawhide-15-3.noarch"
I looked through the list of updates, found the one that read "Fedora release files | fedora-release-15-3 (noarch)" and unchecked it. That did the trick and all other updates installed without any issues. However, error was still there when I tried to update after a reboot! Sounds easy enough, but as some people pointed out, this is a terrible welcome message for a newcomer to the platform. People expect things to "just work" these days and are less likely to cut Fedora a slack. Although, there was no network connectivity until I selected my wireless, Fedora had no issues remembering and connecting to my wifi network afterwards (see this Apple thread if you are wondering where that comment come from). Yet, I think from a usability perspective, I would want OS to ask me to choose a connection upon first login if it detects a wifi connection. It looks like Power Management is a bit aggressive Out of Box as in OS X. If you do not use your machine for about 20secs, screen becomes darker. Fully charged laptop claimed it would drain in about 2hrs but I am yet to test how fast it discharges under my normal usage. 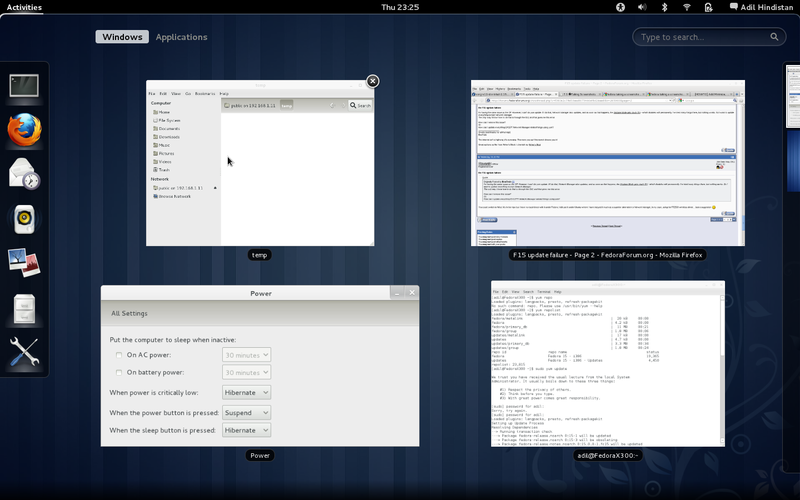 Ubuntu has live, warm colors (I like "Orange") out of box (OOB), Fedora has "grey" as its primary color. I think it's a bad choice as it fails to give a polished look when you log in for the first time. Yes, it's of course easy to change this and some Linux-fans loath eye-candy but first-impression matters. 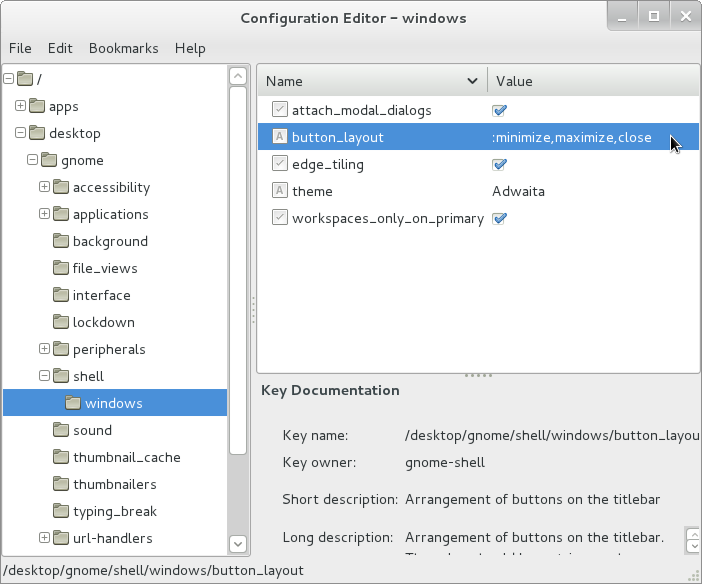 Gnome 3.0 is a radical change from past. It's annoying for to save something into ~/Desktop folder only to find that it does not show up on the Desktop. I know the arguments against it but we will see if this heavy-handed approach will work (I am betting it will not as it creates confusion). Simply typing the following would not work as you must be root. Tiring? Yeah! It does not really matter that much on a mobile platform as people would usually prefer to put the machine to sleep anyway, which may be one of the reasons why shutdown is not there, but seems counter-intuitive on a desktop platform. One last 'annoyance' was the absence of 'minimize window' button. Well, to be clear, I am not even talking about what happens when you happen to click "Help > About" in Firefox, where you end up with a modal window which you can only get rid of by hitting 'escape' on keyboard, as there is no button to click but windows that have a button are missing minimize and maximize buttons. By default, Windows only have "close" (X) button. Well, these are just a couple of my first-impression notes. Ars Technica also has two good articles to read "Fedora - first Look" and "Gnome review". There is a lot of talk about the new systemd, and I am looking forward to checking it out. Well, I guess the answer depends on what you want to do with it. 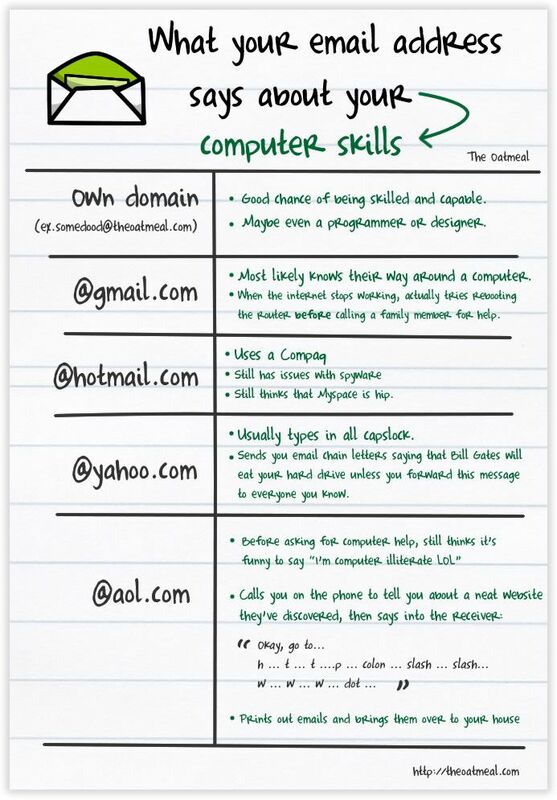 There are many services out there that let you register your domain. 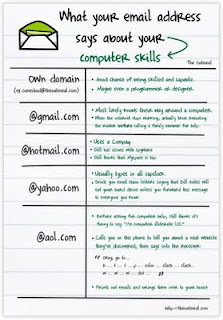 GoDaddy.com is probably one of the most famous one. I used their service and it got better over the time. If, for example, all you want is that people reach to your blog when they type your new domain name, almost all registrars do that free of charge. But, then what? I will tell you what I like to do with the domain names I register for personal use. Well, first thing first, I love Google services. 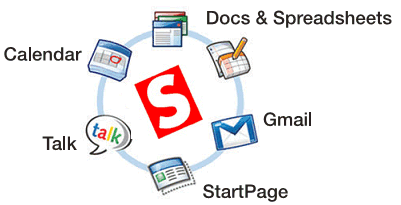 I would like to have an e-mail service for my new domain, that's managed like gmail. 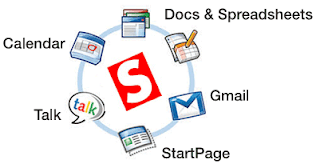 Enter "Google Apps". Google is not a domain registrar per se but they have a partnership with one and you can easily get your domain name registered and Google Apps domain created for $10/yr. Once you do that, Google automatically adjusts all the necessary DNS settings for you and if you would like to manually edit anything, you can easily do that from within Google Apps dashboard. Simple! One added benefit is that, your personal information is hidden from WHOIS directory. Normally, you get charged extra for that. This is especially useful, if you would like to have a private domain that you only use for certain (private) activities. For example, you could buy something like "mysecretdomain.com" and configure an e-mail like "me@mysecretdomain.com". Then, use only that e-mail when your finances are involved (bank accounts, e-bay, amazon etc.). You might also use Google docs from that domain only to keep private stuff and use your, say, gmail account for everything else. This might also help reduce the attack surface if someone is trying to steal your known account. If you, for example, had a weak password recovery option with your gmail and someone guessed it, they still would not know about your secret domain where you keep the important stuff, which might reduce the damage... It's a wild world out there, you can never be careful enough! Should you change your DNS? A couple of days ago, I was talking to a friend who is running a small office in NY. He complained about how they were frequently having issues accessing web sites, the sluggishness and the inconsistencies they were experiencing. The more we talked, the more it sounded like taking a look at their DNS servers was in order. They did not, however, have a dedicated DNS, and were using whatever DNS servers their ISP was assigning to them. People do not need to use DNS servers their ISPs assigned to them. There are many public name servers that can be used instead. Google's Public DNS is probably the most famous one and I fully recommend it. Open DNS is another one that has been out there for a while. Not only using public DNS may improve the speed of your browsing but it may also help you get a little extra security. 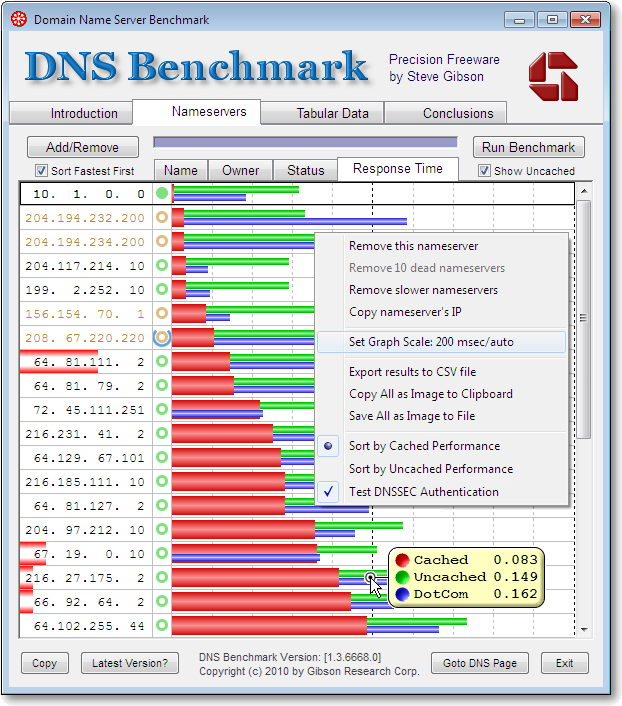 I recently came across a little (literally - just 163KB) utility called DNS Benchmark by Steve Gibson which can tell you which name servers would be the fastest for you. As I guessed, Google's Name Servers, which I have been using for quite some time now were the fastest for me. In my case, it was not the name resolution speed that pushed me to switch to Public DNS. I hated it when my ISP intercepted mistyped domain names. If you do that, you should normally get a "404 - Page not found" error. Instead, you notice that the url you typed is put into a search web site branded by your ISP and results are shown to you. ISPs are not really doing this out of goodwill to help you, they get money out of it. They get paid for the keywords and appropriate results show up near the top. You can read about that whole story and how that is being used for Phishing attacks here. Once you decide to use a public DNS, I guess the easiest way to implement this would be to enter the IP addresses of the Public DNS in your Router and let it distribute them via DHCP. It's pretty easy to do. Here is the screenshot from my LinkSys (Cisco) E3000 router. In most cases, you can reach your router's set up by typing 192.168.1.1 into your browser and logging into it. The settings you see above are located under "Setup" > "Basic Setup". By the way, if you are using Google Chrome, it is up to you to choose whether Google should display you some suggestions when you mistype a url or a domain name. Here are instructions to turn on or off this option. Good luck!